The FH Kufstein offers its exchange students, i.e., its incoming exchange students, a special International Program (IP). 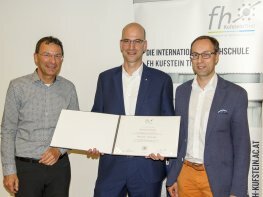 The IP is open to all students from our partner universities just as our partner institutions welcome the students from the FH Kufstein when they do their compulsory study-abroad semester. The IP offers a range of courses, all of them held exclusively in English. The curriculum consists of courses designed specifically for the exchange students as well as selected courses from the bachelor and master degree programs of the FH Kufstein. In the context of the latter, incoming exchange students join our regular students, which ensures they are well-integrated in the learning environment at the FH Kufstein. The courses in the IP are taught by professors of the FH Kufstein as well as by visiting professors from around the globe. The curriculum covers the subject areas of “International Marketing”, “Management”, and “Finance”, which are all an integral part of the internationally oriented study program. In order to give the incoming exchange students some insights into Austrian history and culture, the International Relations Office (IRO) regularly offers courses such as “Austrian Culture & History” and “German Language”. These courses are a great stepping stone for our guests on their way to exploring Kufstein, its surroundings, and the rest of Austria. Exchange students and visiting professors alike can expect to receive from the IRO comprehensive support and consultation in all matters concerning the International Program and their stay in Austria.